The Xhosa tribe is the tribe of Nelson Mandela, and the term 'Kaffir', is a derogatory name, which means something similar to unbelievers or heathens. Aside from that, this book, published in 1886, is full of 23 wonderful tales. 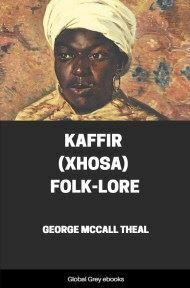 IN South Africa the word Kaffir is often used in a general way to signify any black native who is not the descendant of an imported slave, but on the eastern frontier of the Cape Colony the term usually restricted to a member of the Amaxosa tribe. 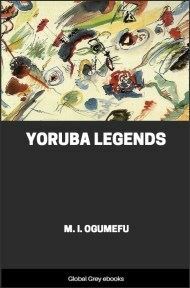 It is from individuals of this tribe that the following stories have been collected. Europeans have designated these Kaffirs ever since the discovery of the country, though they themselves cannot even pronounce the word, as the English sound of the letter is waning their language. R, in Kaffir words, as now written, represents the same guttural sound as g does in Dutch, or the Scotch sound of ch in loch; thus Rarabe is pronounced Khah-khah-bay. They have no word by which to signify the whole race, but each tribe has its own title, which is usually the name of its first great chief, with the plural prefix Ama or Aba. A very large portion of South Africa is occupied by people of this race. All along the eastern coast, as far south as the Great Fish River, the country is thickly populated with Kaffir tribes. 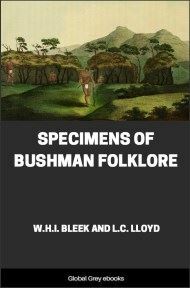 On the other side of the mountains, the Bechuanas, their near kindred, are found stretching almost across to the Atlantic shore, from the heart of the continent southward to the Orange River. The country lying between the present colonies of the Cape and Natal was first explored by Europeans in the year 1655, and was then found to be occupied by four great tribes,-the Amampondomsi, the Amampondo, the Abatembu, and the Amaxosa,-who formed nations as distinct from each other as are the French and the Italians. 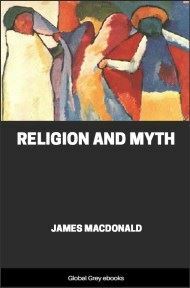 Their language was the same, and their laws and customs varied very slightly; but in all that respected government they were absolutely independent of one another. It has since been ascertained that the tribes further northward do not differ materially from these. The Amaxosa were the farthest to the southward in 1688, as they have been ever since. On the coast they had then reached the Kciskama River, and there is good reason to believe that inland their outposts extended westward as far as the site of the present village of Somerset East. They were thus in contact with Hottentot tribes along an extended line, and an amalgamation of the two races had probably already commenced. It is certain that during the latter half of the last century a great many Hottentots were incorporated with the Amaxosa. The mode of incorporation was in most instances a selection of Hottentot females after the destruction of their clan in war; but in at least one case a Hottentot tribe became gradually a Kaffir clan by mixture of blood through adoption of Kaffir refugees. 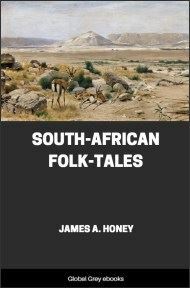 The people of this tribe, a pure Hottentot one in 1689 and then called the Gqunaqua, were found by a traveller a century later to resemble Kaffirs more than Hottentots in appearance, and, except a few families, they are now undistinguishable from other members of the Amaxosa. Their original language has been lost, but their old tribal title is yet retained in the Kaffir form Amagqunukwebe. 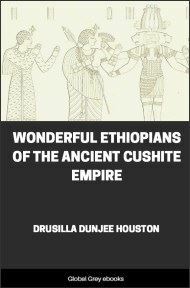 This large admixture of Hottentot blood has not affected the mode of government or the general customs of the Amaxosa, as is seen on comparing them with other tribes to the north but it has affected their personal appearance and their language. Many words in use by the women, though appearing in a Kaffir form, can be traced to Hottentot roots. Owing to this, their traditional stories may have been modified to some, though not to any great, extent. In a condition independent of European control, each Kaffir tribe is over by a great chief, whose government is, however but little felt beyond his immediate clan, each petty division being under a ruler who is in reality nearly independent. The person of a chief is inviolable, and an indignity offered to one of them is considered a crime of the gravest nature. Such offshoots of the ruling house as are not of themselves chiefs are of aristocratic rank, and are exempt from obedience to the laws which govern the commonalty. With regard to the common people, the principle of the law is that they are the property of the rulers, and consequently an offence against any of their persons is atoned for by a fine to the chief. Murder and assaults are punished in this manner. Thus in theory the government is despotic, but in practice it has many checks. The first is the existence of a body of councillors about the person of each chief, whose advice he is compelled to listen to. A second is the custom that a man who can escape from a chief whose enmity he has incurred will be protected by any other with whom he takes refuge, so that an arbitrary or unpopular ruler is in constant danger of losing his followers. The chief in council makes the law and administers it, but from the courts of the petty chiefs there is an appeal to the head of the tribe. Only two kinds of punishment are known: fines and death. Lawsuits are of frequent occurrence, and many Kaffirs display great ability and remarkable powers of oratory in conducting them. The judges are guided in their proceedings by a recognised common law and by precedents, though some of them are exceedingly venal. They will sit, however, with exemplary patience, for days together, to hear all the details of a case, and, where bribery is impossible, their sentences are usually in accordance with strict justice.